In a repeat of yesterday’s Bryson Fire, that ignited in the early afternoon and had burned over 1,500 acres by sundown, today’s Gloria Fire (that broke out about 2:45) has already burned more than 2,000 acres. It appears to be moving southeast through the Gabilans east of Soledad. Homes in Bryant and Stonewall canyon are threatened. Hopefully, as happened with the Bryson Fire, the intensity will diminish overnight – but we haven’t seen much sign of that yet. Cal Fire is reporting 5,000 acres and 1 structure burned, with 15% containment. Sounds like it was a busy night. Cause of fire reported to be vineyard workers using fireworks to scare birds. Yes, setting off fireworks during a red flag fire warning. 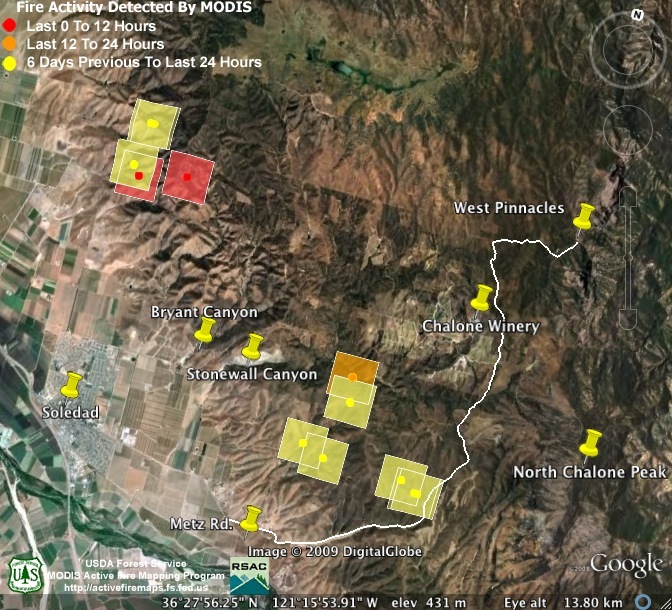 The overnight heat detecting satellite found fire in two areas. In the hills to the east of Gloria Camphora Rd. (nearer to where the fire began), and off to the south, bumping up against Hwy. 146 (the single lane access road to West Pinnacles – which we’ve drawn in as a white line). This is not a “fire map” remember, only an indication of where things were hottest when the satellite made its pass (which appears to have been about 2:00AM). Cal Fire now says 6,000 acres have burned. Containment still only at 15%. Cal Fire has left their size estimate unchanged at 6,000 acres, but has upped their containment estimate to 60% this morning. 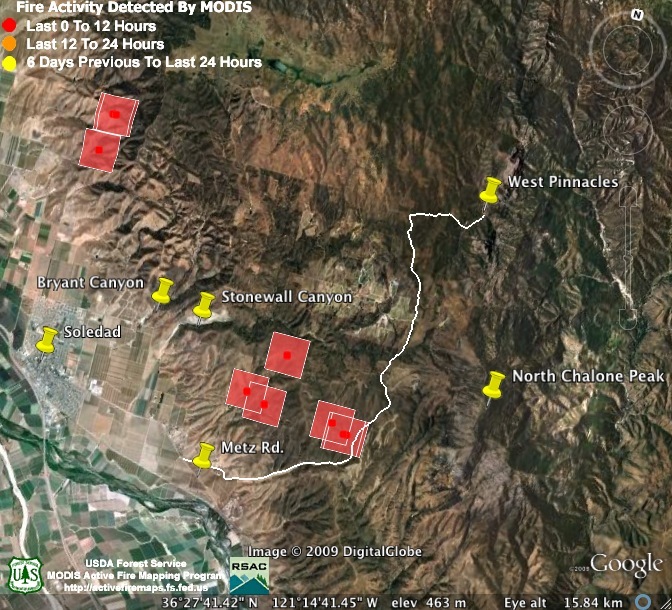 The overnight satellite scan found heat only in the fire’s northern area. That doesn’t mean the fire has gone out elsewhere, of course. It’s just a clue as to where the active burning was around midnight. 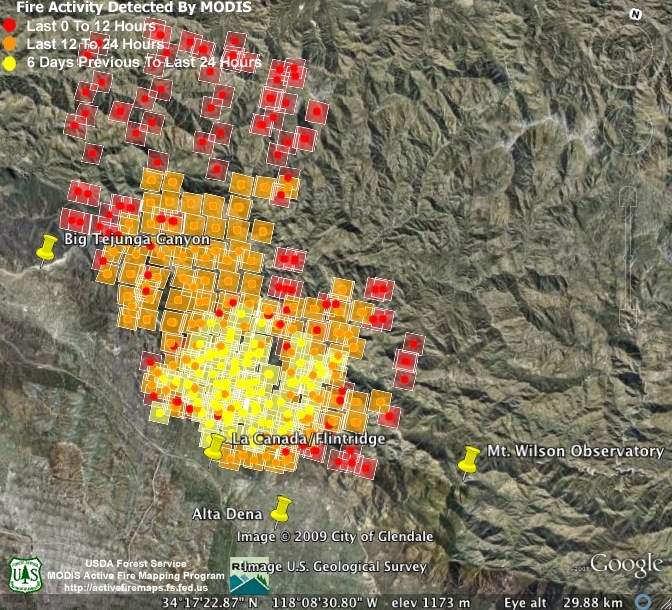 Here’s a link to a Cal Fire perimeter map of the fire as of 2:05AM Friday. Not exactly up to date, but at least they’re offering us something this morning. It looks to us like a very rough guess, rather than a careful mapping job. This morning’s “Incident Update” is available here. Another hot day with fires seemingly breaking out everywhere (Mt. Madonna, Pacheco Pass, Carmel Valley), but apparently a quiet day at the Gloria Fire. Cal Fire has only inched the size up to 6,437 acres. The containment estimate remains 60%. This entry was posted on Thursday, August 27th, 2009 at 8:40 pm and is filed under Fire, Flood & Apocalypse, Gabilans. You can follow any responses to this entry through the RSS 2.0 feed. You can leave a response, or trackback from your own site. Hey, XT, thanks for the map. I just haven’t gotten that part down, yet.